As many of you know, I was in Perth this weekend just gone to support Rose in her challenge of swimming the Rottnest Channel. It was an immense journey and challenge that faced her, but I’m very pleased to report that she completed the 20km swim in 7 hours, 3 minutes. I’m immensely proud of her. 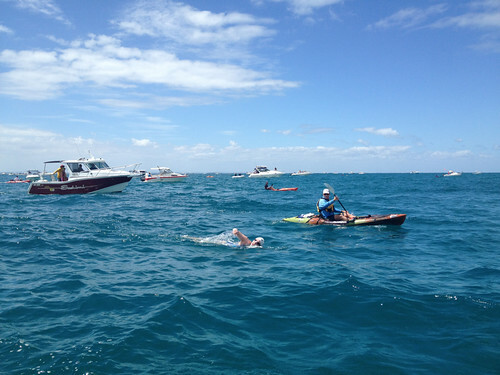 She’s written a great blog post detailing the day and how she found the swim. When I have the appropriate perspective, I’ll also write how my day proceeded and share the experience through my eyes. Her post is excellent – do go and give it a read. With the #b03 blog every day of March challenge beginning tomorrow, this paragraph from her post resonated strongly with me. A little while ago, I encouraged you to join me in blogging every day for March. I was astounded by the take up, and am happy to report that there is a total of 42 people that will be trying to blog every single day in the upcoming month. I’m really looking forward to seeing what everyone produces and creates in that time. Here are some final points to help guide you through the month. If you’re using Twitter this month you can promote your blog posts using the Hashtag #b03. A hat tip to Mr Benjamin Paton, who suggested that in the original post. 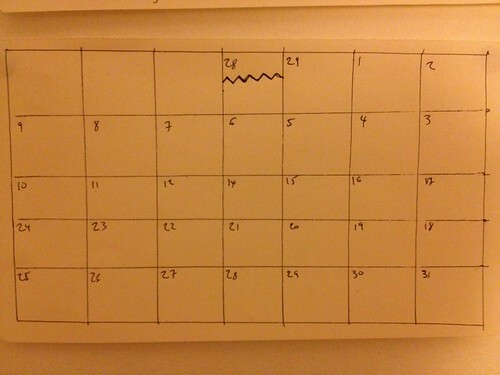 Benjamin will be posting to his Tumblr for March. Feel free to follow along on the hashtag and see what everyone is creating. I was wondering how on earth we could create a place where everyone could simply go to check out all the posts that people are writing, but hadn’t found the time to investigate it at all. Thankfully, Marty Kemka did! He commented on the original post with this link, which bundles all the RSS feeds together in a public place. Brilliant! Thanks Marty! If you haven’t given me the url of your blog, then you’ll need to send it to Marty or myself to get on this page. There are few others, like Ross Hill, who are going to be emailing once daily. There may also be a few Vloggers posting to YouTube daily, so I’m not sure how we’ll surface that content, but let me know anyways where you’ll be creating stuff. Ok, so this is a bit of advice rather than a rule but I’d really encourage you to set up a habit calendar. You can read my post from earlier in the year about how to do that here. It really got me going and is something I highly advise for those of you starting out. This challenge will be easy in the first few days…but it’s after that point that it gets harder. Tweet a picture of your habit calendar to the hashtag #b03 to show it off and keep yourself honest. Here’s my habit calendar for March, ready to go. And that’s it! Good luck for the month! It’s going to be a lot of fun and I can’t wait to see what we create from this. Hi everyone. I’ve been a bit quiet on the ol’ blog the last 2 days as I’m currently in Fremantle, preparing to watch Rose swim to Rottnest Island from Cottesloe. Here’s a video Rose put together yesterday. I’ll be tweeting updates if I have reception from her Twitter account – @roselevien. Have a great weekend! Just a quick post tonight as Rose and I pack for her big swim in Rottnest. My fellow Awesome Foundation Sydney member, Scott Drummond, shared a link with me the other week which I noted to post and share. It’s embedded below. The video walks through how the RECAPTCHA project has allowed for thousands of old world books to be transcribed digitally for record online. It’s quite stunning. The talk connects with many of the themes we’ve discussed here before, like cognitive surplus and translating things online. Specifically, I’m really impressed by the idea that is raised in the video called Duolingo. It helps people learn a new language WHILST they translate stuff from the internet. The crowd is now truly online. We are all connected, and together we can achieve some truly great things without even noticing it. Enjoy the talk. As you’ll (hopefully) notice, this blog has had a small design change in the last day. I’ve been very happy to have trialled the new service ThemePivot, from Ned and the guys at Native Digital. I’ll go in to more detail about how I found the service and some ideas I have about it in another post shortly. For now, what are your thoughts on the new site? I’ve decided to move in this direction for a few reasons. I wrote a post a while ago about designing for mobile first. Unfortunately, my own site didn’t live up to this (!) and so I wanted to begin moving in that direction. Having a block bar at the top of the site with a reduced masthead will help it fit into a mobile brower when the time comes to do a more indepth refresh. 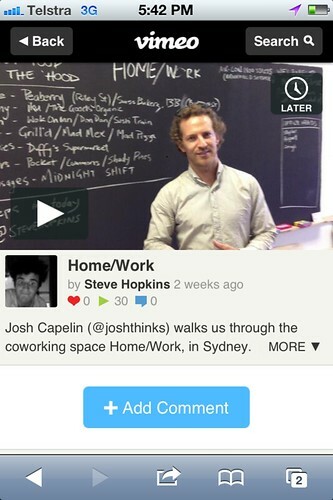 I’ve always liked the design that Vimeo has come up with; both on their old web app, new web app and in their mobile site. For context, the mobile site looks like this. Derek Winter once asked me, some 4 years ago, why he couldn’t subscribe to my blog via email. The old template I used to have didn’t allow for it and I had botched a few things on the backend. In the latest refresh to the design last year, we rectified a lot of this with adding the ability for people to subscribe to the blog via email. We used Mailchimp for this, which is awesome. However, the design has really hidden a lot of this. Many people have been surprised when I tell them that they can click the red mail icon to subscribe by email.